Just loving decorating at this time of year. Anyone who has read my profile in world knows that I am a huge fan of all things Italian…the food, the wine, the people, the culture, the history…ok so maybe not such a big fan of their driving, but everything else gets a big ole tick in the Kess Loves box. I have been looking forward to the release of the new Tuscany Country Cottage from DaD Design for quite some time having originally seen it a several weeks ago. It has two floors of spacious rooms and the most adorable corner stone fireplace. The project to decorate it will take a while and I started with making the room with the gorgeous fireplace the kitchen/dining area. There will be more to follow and I’m quite intrigued by mixing Tuscany and it’s summery, country feel with the Fall season. The Cottage is available at the current round of Cosmopolitan. The Gathering 2015 is a Fantasy Gacha event that I got chance to fly through today and will be going back for more soon too. 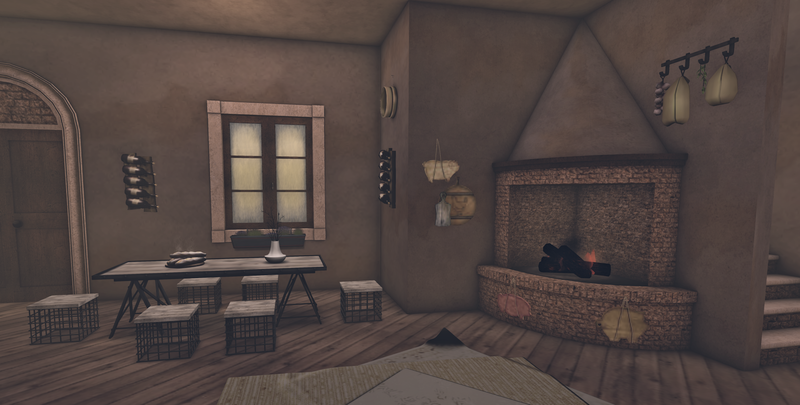 Serenity Style has a great lil gacha set there that worked perfectly with my rustic kitchen. The collection of cutting boards is a great way to decorate any kitchen area, rustic or modern and can be collected from The Gathering. Time now for me to settle down into my gorgeous new kitchen and start planning the next room!